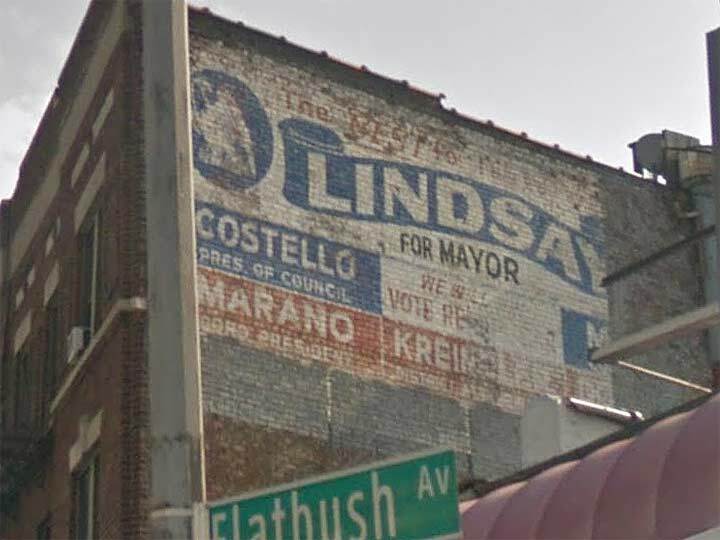 A painted campaign ad for John Vliet Lindsay has been in view for a few years on Flatbush Avenue, visible as you are traveling south at the X-shaped intersection with Bedford Avenue. 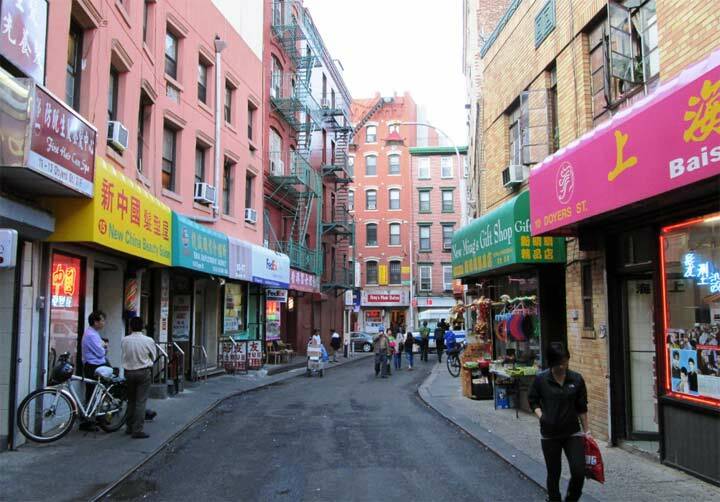 I have been by here a number of times over the years but I was always walking north on Bedford! So, I’ll show you the Google Street View version instead of spending $5.50 there and back. According to Frank Jump, the ad was revealed in 2011 and had been covered by a billboard in the intervening years. The two other names on the ad, (Luigi) Marano and (Timothy) Costello, both lost their races for Brooklyn Borough President and City Council President, respectively. Can anyone identify the other name that begins with KREIN? Since the ad says, “We will… vote Republican” this ad is from Lindsay’s first mayoral campaign in 1965; he ran in 1969 as an Independent and when the vote was split between the Republican and Democratic candidates (John Marchi and Mario Procaccino) Lindsay won again. I don’t comment on politics in FNY, but Lindsay’s first administration was marred by a transit strike his first day in office, and later a sanitation strike, the murders of Martin Luther King and Robert F. Kennedy (Lindsay took a prominent role in mollifying an outraged public), and a severe snowstorm in 1969 that Queens residents say he was derelict in cleaning up. Looks like Kreindler for district leader. Ancestry.com turns up a Robert S. Kreindler who is (or was) an attorney born in 1927 and living in Brooklyn as recently as 1993. He could have been running for state senate at 27 and in line for District Leader at the age of 38. It would likely be the second of these, since the dates are plausible, or some descendant of one of them. There is also a Kreiner (Walter H.)on the site but he attended the 1912 Republican convention, so the odds are against him still being on the active scene in 1965, though it does seem like old politicians never die (or even fade away). That belongs in a museum!!!! A fully preserved painted political billboard! What year is that from? That’s quite an extensive painted ad for brief time to an election. I haven’t been able to tell if it’s Kreindler, but I believe it says he was running for district attorney. I’ve found out that Aaron Koota won that race, but haven’t been able to confirm who he defeated. Kreindler is as good a guess as any. To the right of the “Vote Republican” there is a large capital “M”. No doubt it refers to Milton Mollen, Lindsay’s other running mate (for City Comptroller), who also lost. In Mollen’s race the winner was Mario Procaccino, who in turn would lose to Lindsay in the 1969 Mayoral race. Was this the only time there were ever painted ads for political candidates or have there been others like this one and I’m not taking about bumper stickers on signs? For all those interested, I recall that Kreindler ran for District Attorney and also, Tim Costello could not have run for Borough President of Brooklyn as he lived on Staten Island with me.Mural brings back unbelievable memories. It should be preserved…. I also recall that Luigi Marano was a member of Ed Sergy’s powerful Republican Club in Bay Ridge and served with distinction for many years in Albany in The State Senate. I remember the transit strike. I believe the feisty leader of the transport workers union was Mike Quill. It lasted a long time. I also remember a newspaper strike in 1962-1963. I had to read Long Island’s Newsday. When that strike ended the New York Times came out with a record 7 1/2 pound paper because of all the ads. Anyone remember Mayor Linseed from the Batman TV show? They even cast an actor, Byron Keith, who looked similar to Mayor John V.
Procaccino, Mollen, Marchi – I remember hearing these names all the time on WNEW 1130’s News growing up.